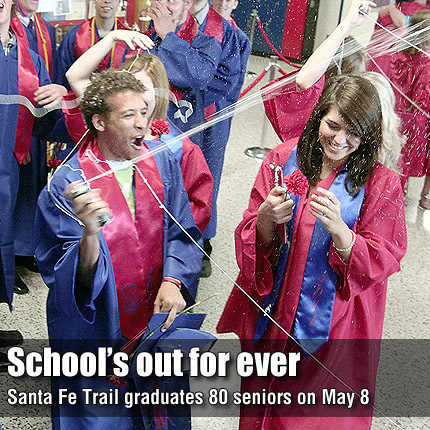 Santa Fe Trail High School graduates get silly following their commencement Sunday afternoon. The school graduated 80 seniors in the county’s first graduation this year. See story on Page 7A. Members of Santa Fe Trail High School Class of 2011 entered the gymnasium Sunday to the familiar tune of “Pomp and Circumstance,” and walked out as graduates. Student Council Co-President Anna Schmidt then introduced Salutatorian Faith Crook. Crook spoke on goals and accomplishments at Santa Fe Trail schools. Crook then introduced Valedictorian Zack Brady, whom she described as being one step ahead of her since his arrival at SFT. Brady thanked those who helped push the class along the way – families and relatives, teachers and faculty – and made sure to include those who shared the honor of the day. “Let’s thank our mothers, who have put up with us and loved us, on this most special of Mother’s Days,” Brady said. The speeches were followed with presentation of the Overbrook Rotary Club Outstanding Boy and Girl. Gerry Coffman bestowed the awards to Zachary Brady and Faith Crook, each returning to the stage to accept them. USD 434 Board of Education President Randy Boudeman recognized the class, as presented by SFTHS Assistant Principal Patrick Graham. SFTHS Principal David Swaim announced each of the graduates as they took the stage to receive their diplomas from current and past board of education members. Swaim then announced his acceptance of the class, as they recessed to the “Raiders March” from Indiana Jones, played by the high school band.